NextAmongst the ruins of Isca Augusta you may just find Adrian Goldsworthy. “Propaganda draws nourishment from the sins of the enemy. If there are no sins, invent them ! The aim is to make the enemy so great a monster that he forfeits the rights of a human being.” – General Sir Ian Hamilton. These are harsh words from General Hamilton, maybe even a little over the top. 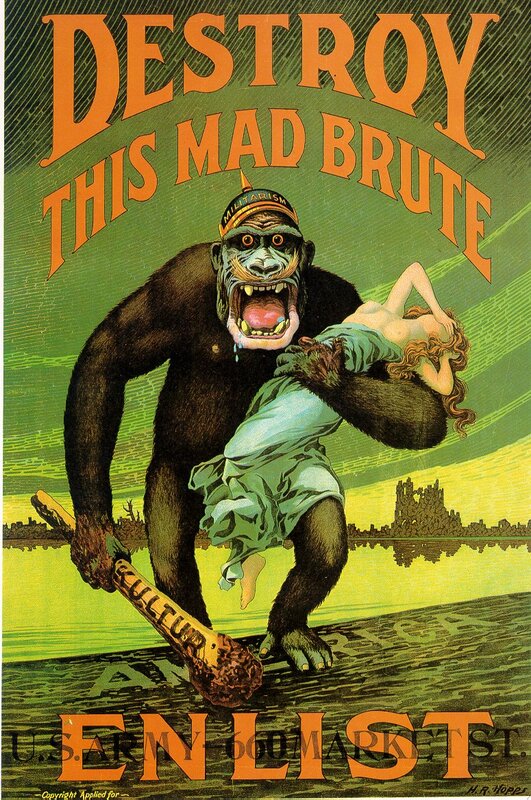 But the First World War brought out the ‘beast’ in everyone when it came to exploitation of war-time propaganda. This was most effectively carried out through newspapers, magazines, cinema and by the now famous WW1 posters. In previous wars men rallied behind the flag, but in 1914 governments needed men, women and children to rally behind their country in a greater cause. The atrocities poster above of the burning Cathedral by artist David Turner is only but one example of the sense of moral outrage Allied propaganda was trying to promote. As the Germans marched through Belgium in August 1914 rumours spread of stories of massacres and killings in Belgium towns. Of course, once word had spread internationally, authorities seized and exaggerated upon this through poster propaganda in an effort to highlight why people needed to unite to fight against evil and aggression. 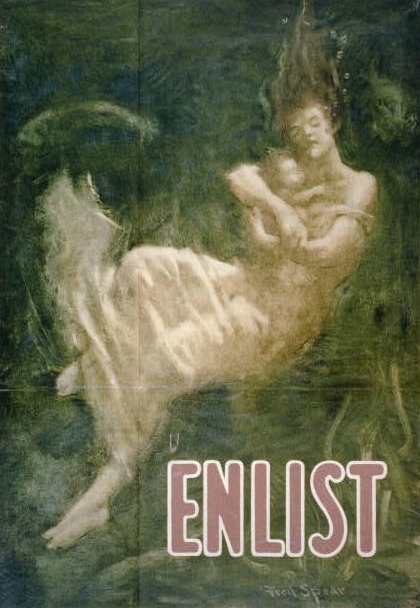 Enlistment posters, which is a topic that will be covered next time, also helped gather up the numbers of men needed to fight this new type of war. It became an essential tool to inform, recruit and persuade the masses. Hundreds of different posters by all the belligerent nations reflected the mood of the day. 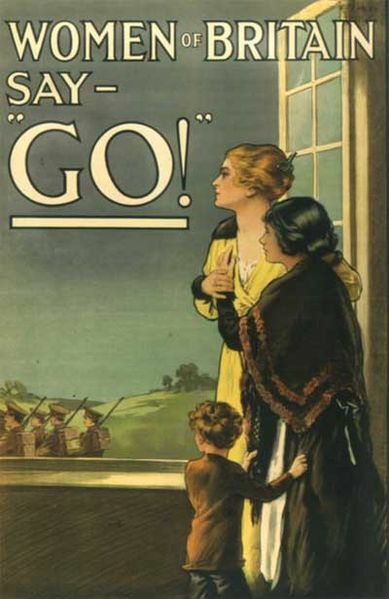 The purpose of the war poster, nationally and across all small towns and villages, was generally to help recruit, to boost morale, raise funds and support the war. But in the form of a tool to persuade (even shame men to join the war effort), alert, shock and demonize the enemy it had its greatest impact upon the populous. It is also “because of the excesses and exaggerations of this effort, the term ‘propaganda’ has come to mean lies.” Below are just many of my favourite examples of wartime propaganda from WW1. 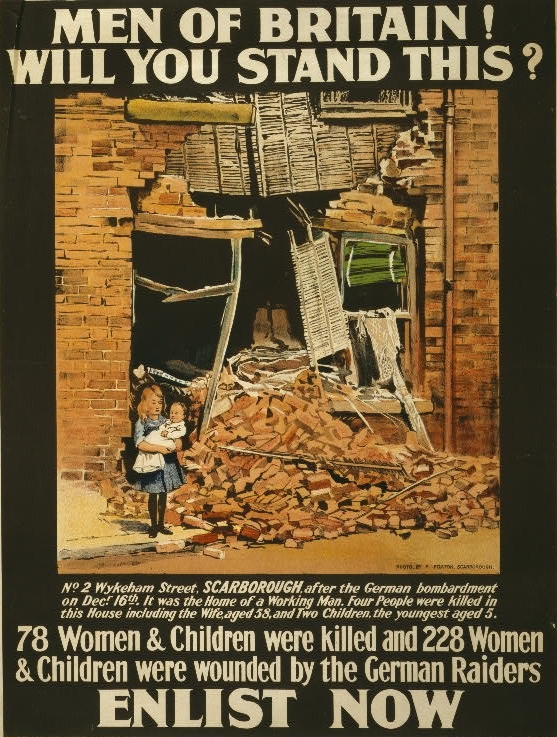 British recruiting poster by an unknown artist is highlighting the devastation of Scarborough by German naval artillery. In all there were 592 casualties, of which 137 were deaths. Terror on the seas ! The sinking of the Lusitania turned public opinion against Germany, in particular, in the United States who lost 128 citizens in the attack. Though did it ultimately contributed to the American entry into World War in 1917 ? 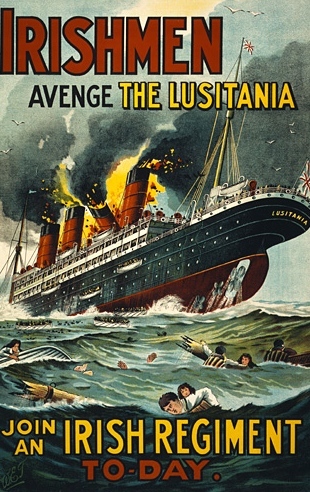 The Lusitania became an iconic symbol in recruiting campaigns of why the war was being fought. Justice over barbarism, good verse evil? This poster was inspired by the sinking of the Lusitania. American artist Fred Spears remembered reading the tragic events of the ship sinking. He used only the image of a young mother and her drowning baby as a call to enlist. Very haunting and to the point. The demonizing of the enemy was a common poster during WW1. Here in this 1917 US Army recruitment poster, accredited to H.R. Hopps, the Germans are shown as a savage beast threatening America. In the background we can see the much used landscape of destroyed towns, while in the foreground ‘Liberty’ is seen in the hands of the brute. 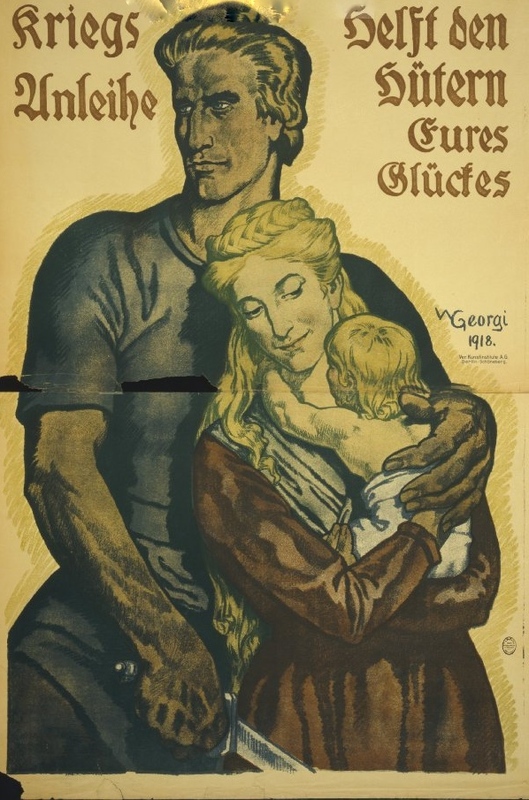 Kriegsanleihe, helft den Hütern eures Glückes Poster shows a strong German man holding a sword with his other arm around his wife and baby. The caption says ‘War loans help the guardians of your happiness. During the initial advance of German troops in August 1914, the first horrible acts of violence against civilians and property took place. 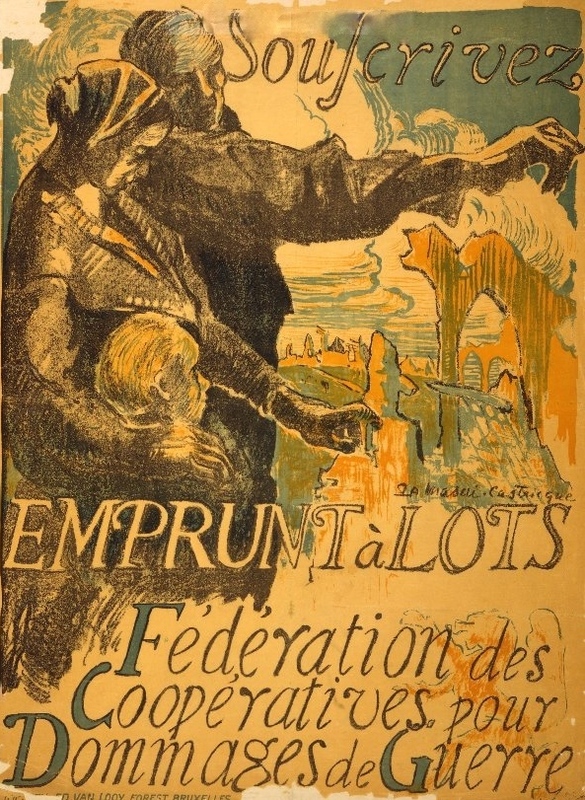 The events that accumulated in the widespread dismay and destruction, especially in Belgium, were used to great effect to damage the reputation of Germany around the world in posters such as the one above. 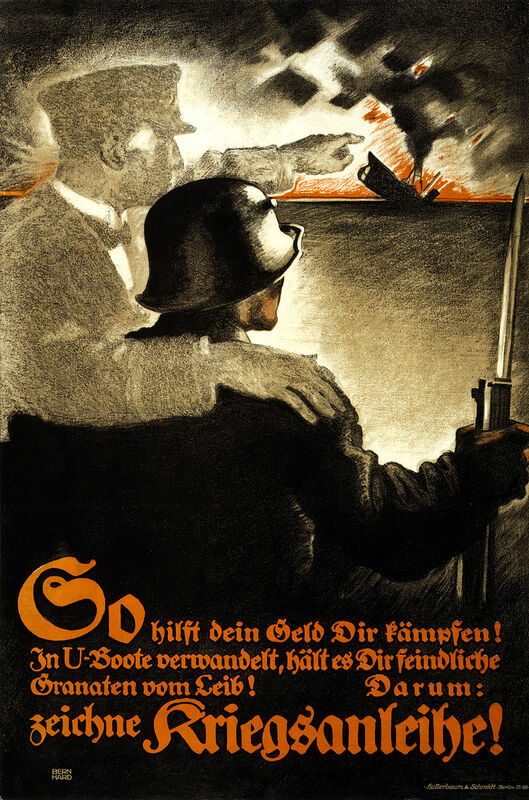 Austrian poster with a plea for its people to buy war bonds. Again the image of women and children is used to show their plight. Images of devastation and ruin is also a reoccurring theme. Men who were not eager to join their ‘chums’ had their loyalty, character and masculinity put into question. Recruiting propaganda such as this played upon the negative attitudes Canadians held for those who did not response to the call to join. 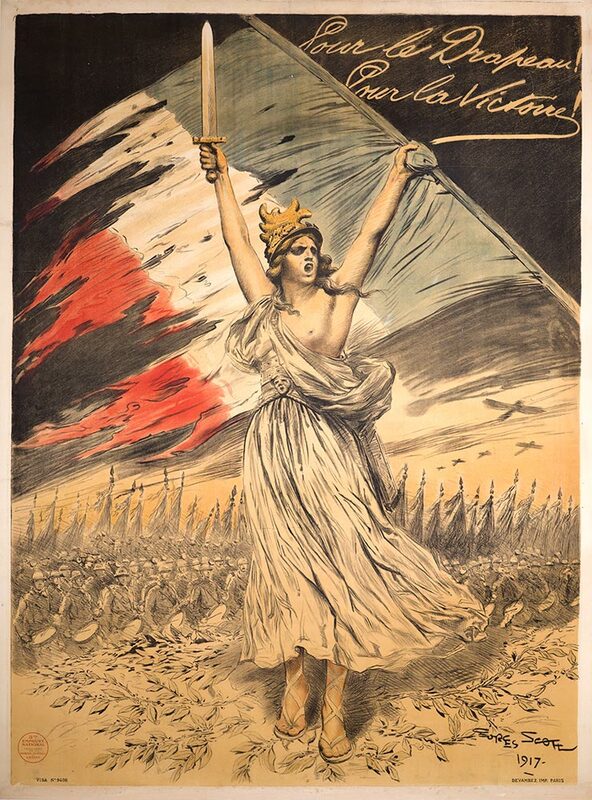 This is a French poster from 1917 by Paulbot entitled ‘For the flag !’ A semi-naked ‘Liberty’ stands arms outstretched calling Frenchmen to stand up and fight. Seductive images of women were used to attract men into war service. In this Howard Chandler Christy poster, an attractive young woman treats the targeted audience (future recruits) with a coy smile of invitation. 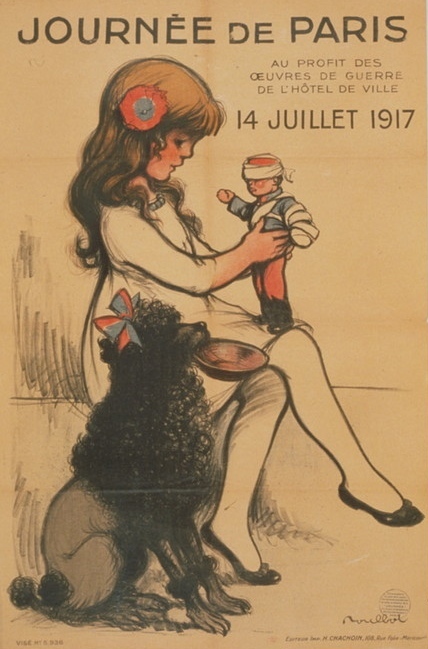 This is an interesting French poster by George Scott showing a well dressed little girl playing with a wounded soldier. Behind the frontline of war, millions of little girls wished for the war to end. With her parents not depicted in the poster it can only mean they were either at work in the factories or on the battlefront. Is the point of the poster to remind us of the fortunes of war? The defence of women and children was a reoccurring theme used in propaganda posters. It was also used to emotionally blackmail men to join the fight. It was often quite a power tool. Poster was printed in 1915 by artist E. Kealey. 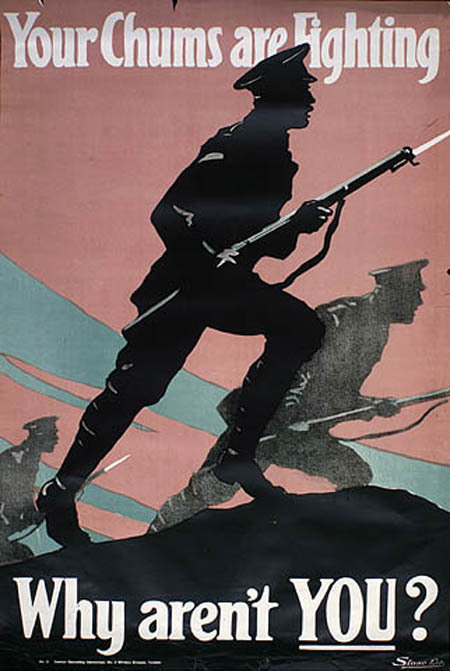 Rosalind Ormiston, First World War Posters, Flame Tree Books, 2013. Photo Credit Every effort has been made to trace and acknowledge appropriate credit. All images are in the public domain except “The Huns have desecrated & destroyed the Cathedrals of France and Belgium” Atrocity Poster by David Turner, which is courtesy of the IWM who own the copyright © IWM (Art.IWM PST 13606) It is used under the IWM non Commercial License. “Your Chums are Fighting…” poster 3g12171, “Women of Britain say Go !” poster 3g10915 & “This is how your money helps you fight!” German poster 3g11518 and “Gee!! I wish I were a man…” poster are Courtesy of the Library of Congress, Prints and Photographs Division, WW1 posters. Excellent post as always, Robert. I’m loving this series. Looking forward to Post 7! Very informative, Robert, thanks. It would be interesting to know who the artists were, and whether any of them gained from other works they created. I believe many did gain from it. Artists and illustrators were commissioned by official war committees. Some artists went on to do more than one poster. It is believed a majority of them were anonymous. The Posters of WW1 also often reflected the art style of the day like Impressionism or Cubism.Thanks for keeping me on my toes ! Beautiful artwork, compelling but disturbing to realize it’s intent. The creative act is such a thing of tanscendent beauty, yet here we realise how powerfully it can can be consumed and corrupted by collective insanity. Great post! I have some of these in a collection! I can’t remember where they came from, but I have the ‘Women of Britain, Say Go!’ one on my wall 🙂 Not that I approve of propaganda.